You’ll want to make sure you add these Gluten-Free Vegan Oven Baked Zucchini Fries to your healthy snack list! They’re easy to make and everyone will love them. What do you do with extra zucchini you may have this summer? 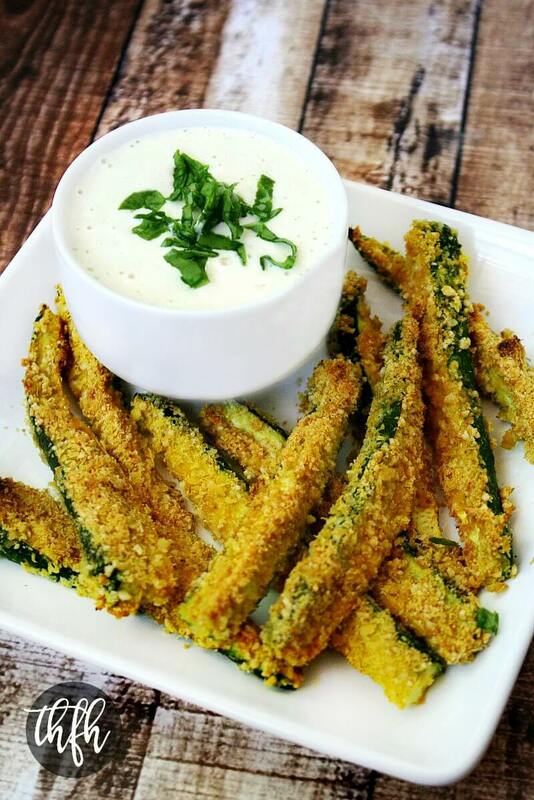 Why you make these addictive zucchini fries…or my Gluten-Free Vegan Oven Baked Zucchini Chips! They’re made with fresh zucchini and coated with my Gluten-Free Homemade Bread Crumbs and will be gone faster than it takes to make them. I promise! 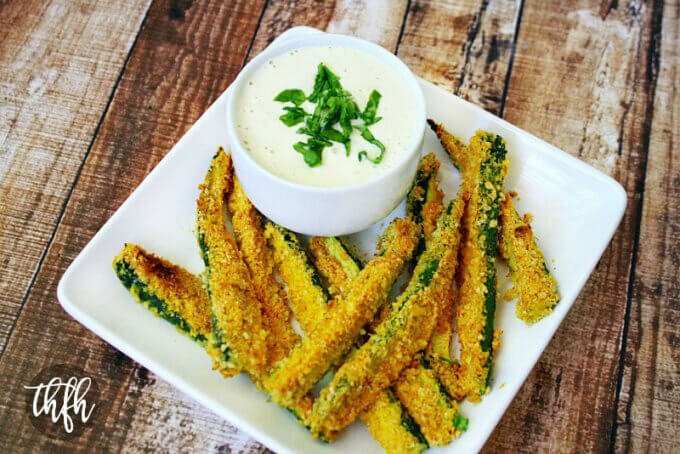 I’ve made several other recipes using my bread crumb coating like Healthy Oven Baked Green Tomatoes, Gluten-Free Vegan Oven Baked Avocado Fries or Gluten-Free Vegan Oven Baked Chipotle Jicama Fries with Creamy Cilantro Lime Sauce that you need to try. You can add more or less cayenne pepper to the seasoning depending on how spicy you like them or whether your little ones will be enjoying them. This healthy snack is vegan, gluten-free, dairy-free, egg-free, oil-free and paleo-friendly. Want more healthy snack recipes? Check Gluten-Free Vegan Flourless Zucchini Brownies, Raw Zucchini Hummus, Lemon Dill Zucchini Chips or my Clean Eating Cookbook with an entire chapter of 20 healthy, clean eating snack and side dish recipes just like this one that you will love! Add all the ingredients for the seasoning to a small bowl and stir until well combined. Set aside. Cut both ends off the zucchini, then cut it in half. Leaving the skin on, slice it into thick fry-size pieces. Repeat for the second zucchini. Set aside. Start an assembly line in this order: sliced zucchini, small bowl with almond milk, small bowl with only 1/2 the seasoning mixture, baking pan lined with parchment paper. Dip each piece of sliced zucchini into the bowl of almond milk, then drop into the bowl of seasoning mixture, toss until all sides are covered, then place it on the baking pan. Repeat until you run out of seasoning mixture. When you run out of seasoning mixture, add the second half to the same bowl and repeat the steps above until you run out of zucchini. (I've found that about half-way through, the seasoning mixture gets saturated with the almond milk and doesn't stick as well to the zucchini, so I started halving the mixture). Place the baking pan in the oven and bake for approximately 15-20 minutes, or until the coating becomes golden. Flip the fries over and bake for another 15-20 minutes, or until the coating becomes golden. Take care not to over bake or burn them. The recipe and photographs for "Gluten-Free Vegan Oven Baked Zucchini Fries" by Karielyn Tillman of The Healthy Family and Home website are licensed under a Creative Commons Attribution Non-Commercial No Derivatives 4.0 International License and cannot be used without my written permission.